I am one of the very rare dog breeds. You might have heard me referred to as the Royal Dog of Madagascar because years and years ago, royalty were the only people who could have me as a pet. I was considered so special that if anyone other than royalty dared have me, they could be sentenced to death. That isn�t the case these days, though, so don�t be afraid to take me home with you. I am intelligent and affectionate and my long, cottony hair sheds much less than most dogs. People with allergies tend to like me, also, because my hair doesn�t bother them. When fully grown, I am between 10 and 12 inches tall (25.4 to 30.5 centimeters) and I weigh between 12 and 15 pounds (5.4 to 6.8 kilograms). 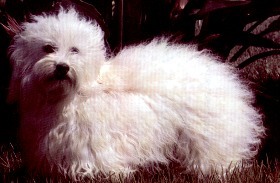 We have no Coton De Tulear Breeders listed at this time. Click here to place your Coton De Tulear Ad!